Banjo and Kazooie are facing their greatest adventure yet, battling long-time nemesis Gruntilda for rightful ownership of Spiral Mountain. Use your wits and imagination to invent wild and wonderful contraptions so Banjo and Kazzoie can crush this wicked witch. Rule the road, sky and water in the land of Banjo-Kazooie: Nuts & Bolts! -Discover and explore 6 different worlds with over 100 challenges. -Share your blueprints, team up with friends and battle on Xbox Live. -If it steers, floats or flies, you can build it using over 100 unique parts and blueprints! 10-20-2018 telly Box Text BUILD AN ADVENTURE OF MECHANICAL MAYHEM Banjo and Kazooie are facing their greatest adventure yet, battling long-time nemesis Gruntilda for rightful ownership of Spiral Mountain. Use your wits and imagination to invent wild and wonderful contraptions so Banjo and Kazzoie can crush this wicked witch. 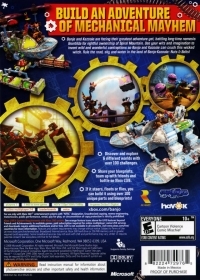 Rule the road, sky and water in the land of Banjo-Kazooie: Nuts & Bolts! -Discover and explore 6 different worlds with over 100 challenges. -Share your blueprints, team up with friends and battle on Xbox Live. -If it steers, floats or flies, you can build it using over 100 unique parts and blueprints! 04-10-2013 artikskarab Box Text BUILD AN ADVENTURE OF MECHANICAL MAYHEM Banjo and Kazooie are facing their greatest adventure yet, battling long-time nemesis Gruntilda for rightful ownership of Spiral Mountain. Use your wits and imagination to invent wild and wonderful contraptions so Banjo and Kazzoie can crush this wicked witch. 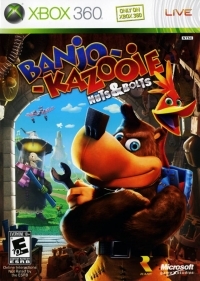 Rule the road, sky and water in the land of Banjo-Kazooie: Nuts & Bolts! -Discover and explore 6 different worlds with over 100 challenges. -Share your blueprints, team up with friends and battle on Xbox Live. -If it steers, floats or flies, you can build it using over 100 unique parts and blueprints! 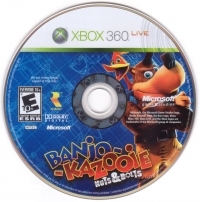 This is a list of VGCollect users who have Banjo-Kazooie: Nuts & Bolts in their Collection. This is a list of VGCollect users who have Banjo-Kazooie: Nuts & Bolts in their Sell List. This is a list of VGCollect users who have Banjo-Kazooie: Nuts & Bolts in their Wish List.